Every Porsche model has an official name and an in-house type number. Sometimes the two are identical, sometimes not – how can the system be understood? Some dreams are difficult to capture in words because they have such long names. 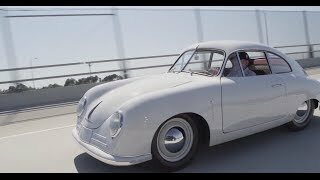 One example is the Porsche 356 A 1500 GS Carrera, which in 1955 conjured up a blissful smile on the faces of automobile enthusiasts all over the world. At that time, the top model from Zuffenhausen looked as if it came from a different world. But in technical terms too, the elegant sports car was absolutely fantastic: “Look, there goes the Porsche three hundred and fifty-six A one thousand, five…” and it had already zoomed past with its top speed of 200 km/h. Admittedly, names can be complicated. Often, however, there is a logical explanation for the model designations: the 1955 model, for example, originated on the basis of the Porsche 356 and was part of the refined A series. It impressed with its engine capacity of 1500 cm³ and was labelled as especially swift by the suffixes of GS (Grand Sport) and Carrera (Spanish for “racing”). Confirmed Porsche devotees juggle skilfully with abbreviations and codes: 356 and 911, 964 and 993, GTS, GT and S, Carrera, Spyder, Speedster. 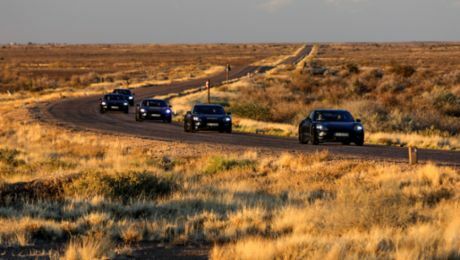 They are all part of the Porsche cult – and every cult has its own code. Yet for many an innocent car enthusiast, the Porsche typology is a rather confusing business. How can a car be called a 911 and a 991 at the same time? Is that a Boxster there or a 987? Or is it a 981? And what do the 4, the S or the Executive stand for on the current models? Here are two practical aids to help you crack the Porsche code. You have to go back to the year 1931 to understand the beginnings of the in-house numbering method. Every order, every project of the newly founded engineering design office Dr. Ing. h.c. F. Porsche GmbH of Ferdinand Porsche was given a consecutive number, the in-house type number. In the beginning it was the number 7: the design of a saloon car for the German car manufacturer Wanderer. Number 22 became the legendary Auto Union Grand Prix racing car and the Type 60 was the Volkswagen. The numbers therefore rose with each new order, with each engine designed, with each drawing for an axle, a gearbox or a tractor. On 8 June 1948, by which time the project numbers had climbed to 356, a novelty came about: for the first time an automobile was made under the official brand name of Porsche. The Porsche 356. This not only marked the birth of a legendary brand, but also a legendary model and one with a memorable design. The 356 underwent further development with each new model year. Substantial advances in development were indicated by adding the letters A, B and C.
The engineers in Zuffenhausen and Weissach then went on to retain this system. Order receipts were good – test engines, naturally aspirated engines, water turbines, racing cars – and the internal numbers were rising faster and faster. In some of the new sports car types, Porsche again used the internal plant code for the official model name, as was the case in 1953 with the Porsche 550 Spyder, the spirited mid-engine car. Yet, it was precisely the successor to the 356 that led Porsche to abandon the customary typology. 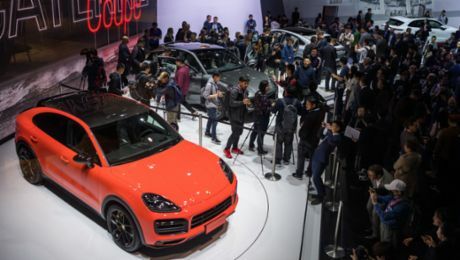 In view of possible future cooperation with the VW plant, the new Porsche was to be compatible with the number ranges used there. As the 900 numbers had not yet been allocated in Wolfsburg, the decision-makers at Zuffenhausen chose 901 for the six-cylinder version and 902 for a subsequent four-cylinder car. However, an unexpected problem arose: the company Peugeot stated that they had been using three-digit numbers with a zero in the middle since 1929 and therefore owned the legal rights to all similar number sequences in France. The 0 was therefore quickly replaced by a 1 – the already existing typeface 1 simply had to be doubled for the brochures and type name on the rear of the vehicle. A legend was born, officially baptised with the name 911. In 1964, no one could have guessed that this 911 stopgap solution would one day become world-famous. Yet the 911 was not to remain the only model line within the Porsche company. The 914 marked the addition of a smaller, lighter mid-engine sports car, and over the years models such as the 924, 928 and 944 were to join their elder brother. They also received their internal number as model names – using the first version in each case. By now, at the latest, the three-digit number starting with a 9 had established itself worldwide as synonymous with the reliable sporting character from Zuffenhausen. Soon, though, the 900 numbers were running out and competing with each other. Nevertheless, for reasons of tradition, the engineers stuck to their system. In addition to the various street-legal models, pure racing cars also had to be allocated internal type numbers. One example is the legendary 917: unveiled at the Geneva International Motor Show in 1969, the extreme athlete secured overall victory in Le Mans one year later – the first of many further racing successes in the first half of the 1970s under the 917 code. Flexibility therefore became increasingly in demand when naming all the Porsche models. The 911 is a clear illustration of this: in the 1968 model year, the series received the internal designation of “A Series” for the first time. In 1969, the “B Series” followed, then in 1970 the “C Series”, up until the substantially redesigned “G Series”, which was presented in 1973. However, special models within the series also received their own type number from time to time, as was the case with the internal Type 930, called the 911 Turbo or the Type 954 (911 SC/RS). In 1988, a major break occurred in the 911 history with the introduction of the completely redesigned 964 model series. The 993 followed in 1993. Then the 996, 997 and, in the current model, we return to the 991. Between the internal numbers of the 911, there are still further models to be found, with examples being the Carrera GT (internal 980), the Boxster (986 first generation, 987 second, 981 third) and the Cayenne (955). The tradition of the three-digit type numbers is being maintained – albeit with a certain degree of creative freedom. In addition to the official designations and the in-house type numbers, the Porsche employees also give some models affectionate nicknames: one model of the 356, for example, was known as the “Dame” (=Lady), the 917/20 version of the Le Mans racing car is remembered as the “Sau” (=Pink Pig). But that is another story entirely. Apart from the official model names, there are also various suffixes to describe the numerous different model versions. Below you will find an overview. Originally, “Carrera” was the name of the Type 547 four-camshaft engine designed by Dr Ernst Fuhrmann. Porsche later used this suffix for the most powerful engine versions, such as the 356 A 1500 GS Carrera or the 911 Carrera RS 2.7. However, Carrera has almost become established as a synonym for the 911 model series. The name comes from the Carrera Panamericana, a Mexican endurance race in which Porsche secured major successes with the 550 Spyder. Apart from the combustion engine, the E-Hybrid models also have an electric motor on board, which provides more thrust while simultaneously emitting less CO2. The Executive models of the Panamera have a body extended by 15 cm, which primarily benefits the passengers sitting in the rear. GTS stands for Gran Turismo Sport and is originally a homologation class from motor racing. The 904 Carrera GTS received this epithet for the first time in 1963. In 1991, the 928 GTS revived the tradition. The GTS suffix is currently used to designate the especially sporty and exclusive models of a Porsche model series. The RS (stands for RennSport[=racing sport]) and is a street-legal model that has been derived from the motor racing version. The designation is, however, also used for particularly sporty models, e.g. the 911 RS America. The RennSport Rennwagen (RSR) [literally: racing sport racing car] is a purely competition version and is not street legal. S for “Super” or “Sport”: a version with a more powerful engine. Today the S consistently stands for “Sport” and, in addition to the extra-sporty engine, additionally includes enhancements to the equipment compared with the basic model. The designation originally comes from the coach-making term for lightweight, open carriages for two people. 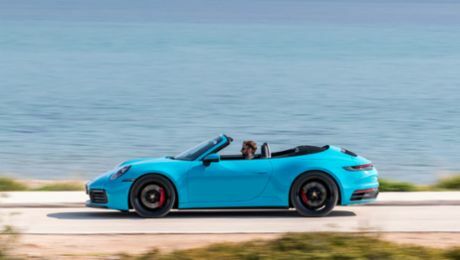 In a similar way to the term Roadster, Spyder at Porsche designates open mid-engine sports cars. The 918 already has a legendary predecessor in the 550 Spyder from 1953. The 911 Targa is an open version of the 911, characterised by its distinctive roll-over protection bar and its fixed roof section. The name comes from the legendary Sicilian road race Targa Florio and means “plate” in English. These models have an engine with exhaust gas turbocharger, which produces a powerful boost in performance. All Porsche models have had an exhaust gas turbocharger since 2015. Available from 1992, the Club Sport (CS) version of the 968 had the same engine but had undergone streamlining for extra sporting character: without window lifts, rear seating and air conditioning, it may have been less comfortable but was significantly lighter and therefore faster than the 968. Similar to GTS, the suffix Gran Turismo (GT) signifies a sportier version of the basic model; the designation has its origins in motor sport since it was possible to homologate vehicles for the GT class. Used for the first time in 1955 with the 356 A 1500 GS Carrera GT, Porsche returned to the designation in 1989 for the 928 GT. Near-production racing version not street legal, used for example in the Porsche Carrera Cup. L for “Luxury”: the third version of the original 911 received this suffix in 1967. Introduced in the model year 1964, the 95 hp 356 SC (Super C) was intended to mark the end of the series. In a similar way to this, the 911 SC (Super Carrera) was introduced in 1977, and was initially also intended to be the last 911 model. However, the series ended up being continued with the 911 Carrera 3.2. In the Speedster models, the windscreen was significantly lower when compared with the basic model, which gave the car a more streamlined silhouette. In return, the driver had to sacrifice comfort in the equipment provided. Although it was also available as a Targa version, the T in the 911 T from 1967 stood for “Touring” – and hence for a less expensive entry-level version of the classic vehicle with a weaker engine.